The popularity of roofs with a flat surface is fully justified. After all, they are cheaper, and also allow you to effectively use the upper part of the house. In this article we will show the device of a flat roof, at the same time we will build on whether it will be in operation or not. It is on this depends the use of certain materials and technologies. 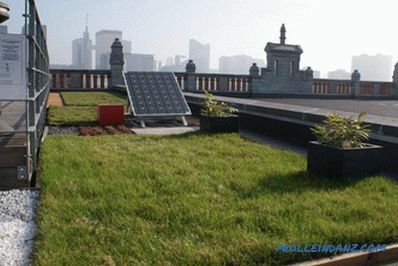 What is remarkable about the flat roof and what are its features? Flat roofs have a number of advantages over traditional pitched roofs. Material is saved (after all, their area is much smaller than that of pitched ones). Saving heat insulation, waterproofing material and vapor barrier film. The time spent installing a flat coating is less. Below and the cost of installation work. A flat-type roof will not be blown away by a strong wind, and sometimes a hurricane. 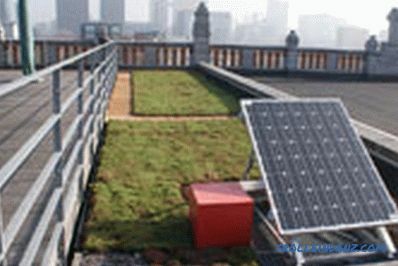 Use this type of roof for residential buildings, office buildings, industrial buildings. Roofs do not make absolutely flat - it is necessary to drain precipitations somewhere. As a rule, this is done by a slope of about 3 degrees. The slope can be made with a sand-cement or expanded clay-cement screed. The base for a flat roof is usually reinforced concrete slabs or sometimes profiled steel is used as the base. 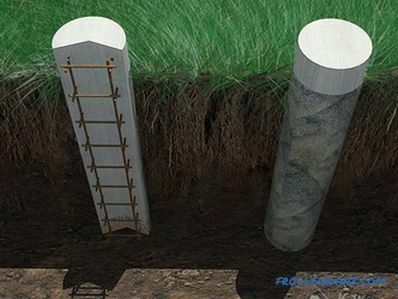 Concrete coverings can be both hollow and monolithic. Well, the roof covering itself is made in several layers. 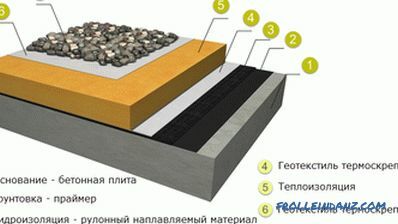 How much of these layers and of what materials they will be made depends on what type of flat roof. Next we look at all possible types of flat roofs. # 1. The operated roof means that you can freely climb onto the roof of such a house, and also place something massive on it. For example, there may be equipped with a green area with a flower garden, swimming pool, summer cafe, parking for cars. In general, this space can be used for a variety of needs. Often the operation of the roof occurs year-round. Naturally, such a roof is simply obliged to have a sufficiently strong base. 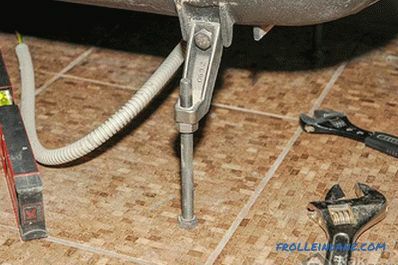 To do this, under the waterproofing layer, which should not be pressed through is a very tough and durable base capable of withstanding significant loads. An example of a flat, operated roof on which a terrace is arranged. # 2. 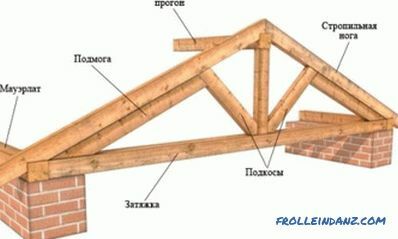 Well, and the second option implies a roof, which you need to climb only as needed, in particular for repairs. For the construction of this roof, a less rigid base can be used, including a profiled sheet. An example of a flat non-operated roof. 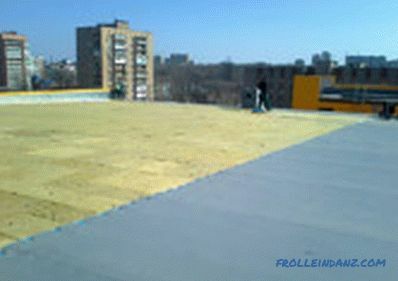 Classic or traditional flat roofs, as they are called, consist of a concrete base on which vapor barrier is laid. It is designed to protect insulation from moisture that can penetrate from the inside of the room. Vapor barrier is produced using a bitumen-polymer membrane reinforced with glass fiber or using a special vapor barrier film. The vapor barrier is laid in such a way that it rises vertically from the edges of the roof to the height of the insulation. On top of the vapor barrier is laid 1 - 2 layers of insulation, which is covered with a carpet of bitumen deposited materials. A little earlier (10-15 years ago) flat roofs had a significant drawback - the waterproofing layer laid last, quickly collapsed. And the snow with rain and hail contributed to this, and the heat with frost, and the evil ultraviolet rays of the sun. And then they invented an inversion roof, devoid of this disadvantage. 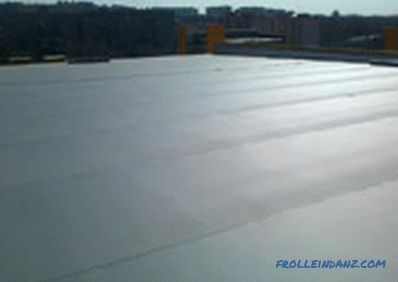 The technology of flat roofing of this type is as follows: waterproofing is placed on the concrete, then thermal insulation (it is optimal to use extruded polystyrene foam that does not absorb moisture). Next come a geotextile coating and drainage. The top layer is protective, and it is often made bulk. 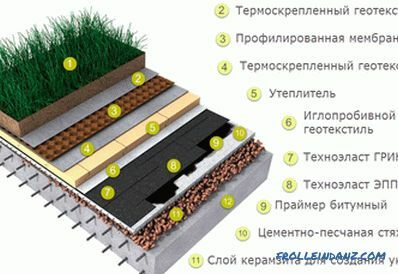 Roofing cake of the inversion flat roof. 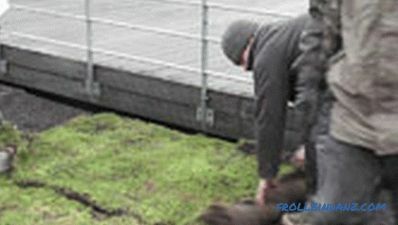 Now the waterproofing is well hidden, so it is not so easy to destroy it. Since the insulation is located on top, condensation does not form. If something gets damaged and needs repair, it is easy to remove the heat insulator plates and then put them back in place. This is how a simple inverted flat roof can look like in finished form. 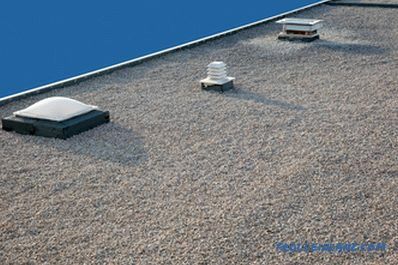 It is not a secret that it is excessive moisture of a heat insulator that greatly impairs the protective properties of the roof. Because of this, it can easily form bubbles and cracks, especially in summer, when the insulation, heated from the sun, actively evaporates water. In addition to insulation moisture may be present under the layers of the old roof, in a concrete base, screed. As a result, in the absence of ventilation, the roof covering may peel off from its base. The invention of a "breathing" roof helped get rid of this scourge - the moisture in it can evaporate freely, going outside. 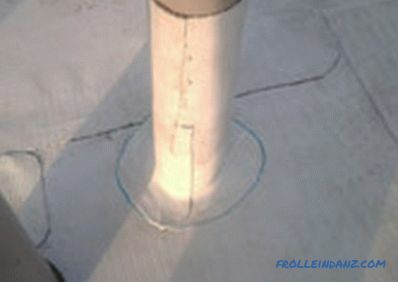 The device used here flat roof of roll materials of the deposited type gives excellent tightness and long service life. 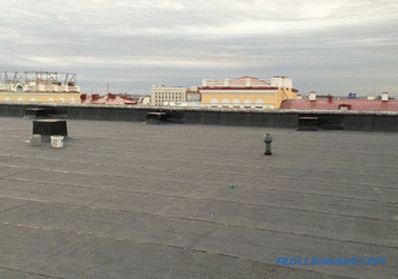 Between the strips of bitumen mastic is a layer of insulation, and the roof is ventilated with roofing aerators, which are installed on its surface, at the rate of 1 piece per 50 m 2 . Roofing cake of a flat breathable roof. By mounting such a roof, there is no need to remove old flooring (this, by the way, may cause leaks in concrete). By fusing the old coating, we, on the contrary, increase the hydroprotection. The second layer (after the old coating) for leveling the surface gives an excellent outflow of moisture. After all, this layer is placed with a slope. This method can be used both for new construction and for renovation of an old building. 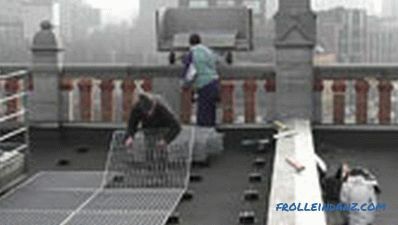 Example of a ventilated flat roof. Places in modern cities are becoming less and less, therefore, extra parking or a summer cafe on the roof is an excellent way out. Well, and in your own house on the exploited roof you can equip a cozy place to rest. As far as technology is concerned, a standard terraced roof is characterized by the presence of a reinforced concrete base, on which the vapor barrier layer lies. Next come the heat insulator and hydroprotection. And at the very top there is a terraced cover, which is made very durable. 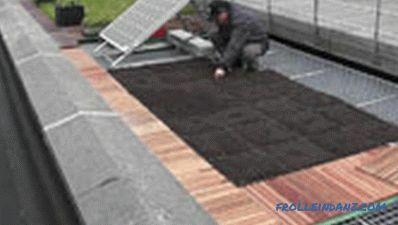 Most often, pavement tiles are used for this, under which a sandy pillow is put (instead of it, plastic holders can be used). Roofing pie of a flat operated roof. The extra space does not fit anyone, and you can use it as you like. 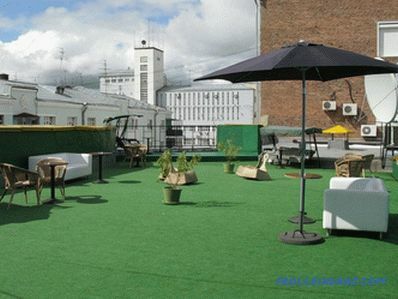 Having realized an interesting design idea, you can get on the roof a beautiful corner where you can relax, relax in silence, take a sunbath. In our "stone jungle" people are sorely lacking green. This deficiency fully compensates for this type of roof. It can become a pretty trimmed lawn, rows of bright flowerbeds, and sometimes a whole public garden. Just keep in mind: to decide that a garden or lawn will appear on the roof, you need to advance in advance - at a time when the house is being designed. 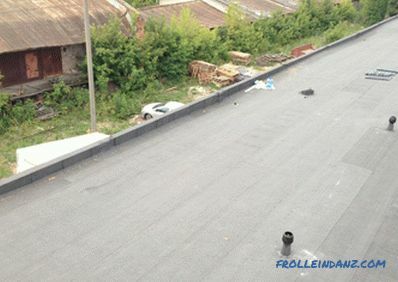 Technology, one might say, is common for flat roofs. The main thing - to make high-quality and reliable protection from water. 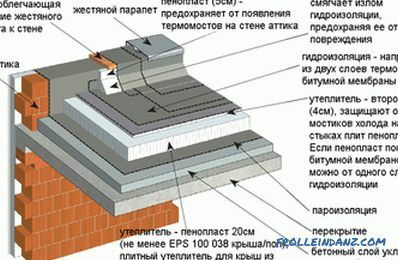 For a device of this type of roof, a waterproofing layer is placed on the reinforced concrete, and the top is covered with a layer of heat insulator (in this case, nothing has yet been invented better than extruded polystyrene foam). 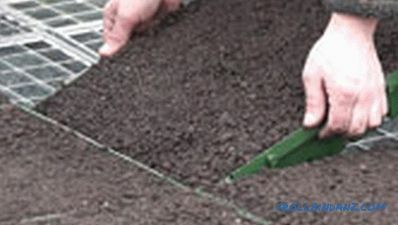 Next - geotextiles and drainage, which serves as gravel or gravel. After that, the drainage is closed with another layer of geotextiles - so it will not wash away our soil. At the very end, they pour earth and plant it. The cake structure of a flat green roof. The advantages of such a roof are immediately noticeable - such a green oasis will add health and restore mental balance. The main thing is to make sure that this oasis is built by professionals, and the materials are used only of the highest quality. Otherwise, repair a lot of money will rise. Polyvinyl chloride (PVC) membrane is good because, due to its use, the need for an additional waterproofing layer is eliminated. And she has a wonderful quality - thermoplasticity. This means that its seams can be easily sealed with hot air. 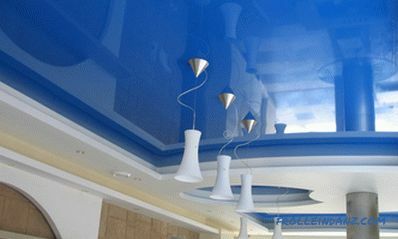 EDPM membrane is made of synthetic rubber, it is elastic, durable and resistant to UV light. 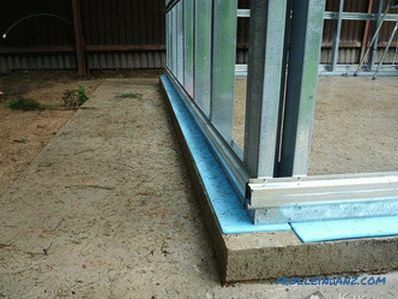 Both reinforced concrete slabs and metal profiled sheets can be used as a base for membrane types of roofing. Well, and heat insulation is best done from mineral wool. To do this, take either hard plates of this material, or combined. PVC membrane is installed directly on the base through a layer of insulation (it must be laid separately).Fastening occurs in those places where seams are formed between the rolls of material. Fasteners used special. Structure of the membrane roof pie. Both types of membranes (both PVC and EDPM) last for a very long time, while easily carrying any loads. Manufacturers produce large width membranes, which makes it easy to pick up a roll of material for a roof of complex shape. There will be very few seams. Both the frost and the heat tolerate such a roof perfectly. The laying of this material is not difficult because it is very light. Therefore, the base is not required to strengthen. It is easy to repair PVC membranes, and after repair, their properties do not deteriorate at all.